What’s not to love about the rags-to-riches story of a 16th Street Mall cart that was so popular they opened not one, but two brick-and-mortar restaurants? Biker Jim’s is the American dream come true, and Denver’s all the better for it. And even despite all of their success, none of it has gone to their head. The people at Biker Jim's are as down to earth as ever, and the cart that started it all is still on the mall serving up lunchtime goodness. So all you pleated khaki and pant suit types, hit the pavement for a dog. Save that sad turkey sandwich for another day. Biker Jim’s is all about creativity via exotic meats, including reindeer, wild boar, and rattlesnake-pheasant. With 13 different dog options and 7 special toppings, you’re looking at 91 potential combinations from this menu - and not a one of them will let you down. Not sure that a rabbit and antelope sausage is something you can get down with? You can, and you will. All you have to do is let it into your life. And should you have some religious belief or policy about not eating cute things, don't you worry. Biker Jim's does a really good vegan dog as well. 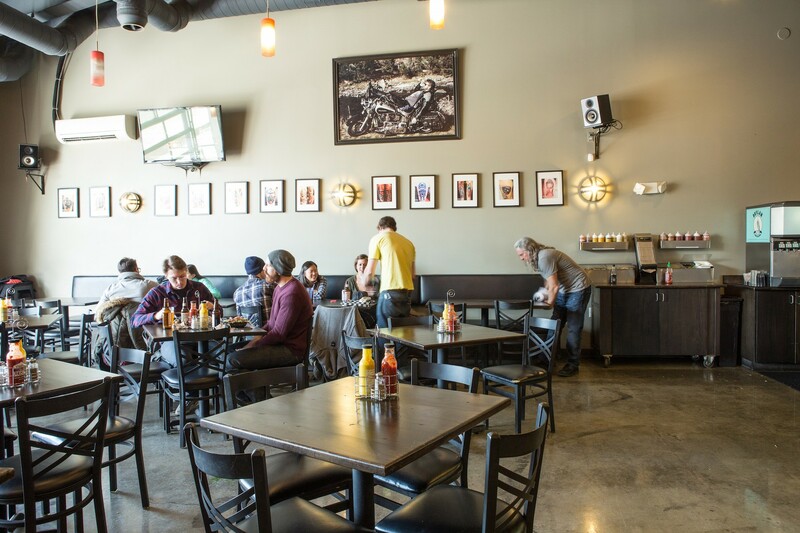 Aside from a place to eat crazy/delicious things, Biker Jim's near-LoDo location makes it a great spot to pre-game for a night out or hit up some late night eats. And since Coors Field is just around the corner, we’re petitioning for a satellite location inside the Rock Pile because we’re now embarrassed to have ever eaten a Rockie dog. We have also yet to observe a biker on any of our visits, so no Roadhouse-type fights have popped off that we're aware of. We'll keep our scooter parked out front just in case. This jackrabbit and antelope combo is our favorite dog a Biker Jim's. Go with the El Diablo topping (tomatillo salsa, sriracha, and smoked bacon bits) or the Sonoran(pintos, diced jalapeños, mayo, mustard) for best results. The menu says it’s mythically delicious, but thankfully you can have it in real life. We’re big fans of this combo and it’s sweet meets savory taste. We think you will be too. A surprisingly delicious option for the no meat crew. Yes. Between the buffalo and green chiles, this is Colorado incarnate. All of the hotdogs here are great, but American exceptionalism is most clearly personified at Biker Jim’s in the form of an all beef dog wrapped in bacon with chili, onions, and yellow mustard on top (AKA, The Coney). A true meat feat. Crispy, savory goodness and hot damn is that tomato-curry jam tasty. We may never stop eating any of the jams actually. Yes to deep fried pickles, and yes to baked beans. And you’re going to want a chipotle brownie ice cream sandwich, because obviously.